I said YES to great skin all thanks to CLINIQUE! 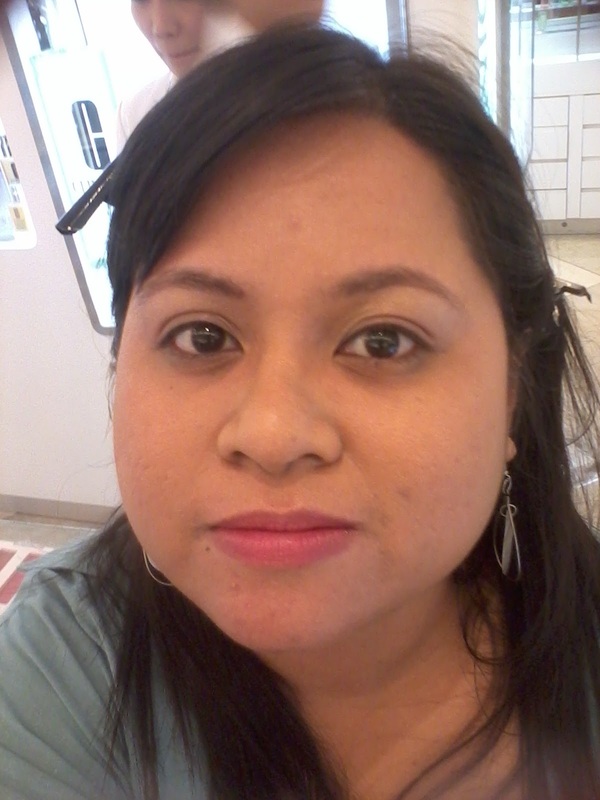 So like I mentioned earlier, I was given this wonderful chance to have a Clinique makeover thanks to Charlesangel's Clinique Party invite. One thing I appreciate about Clinique is their focus on skin care and customizing the skin care products especially for your skin care needs. So I had a wonderful time chatting with Miss Baby, my Clinique skin consultant and she started the session by asking me several questions about my skin concerns. She explained to me that Clinique has identified four skin types and will address the concerns for these types. Then she started to ask me a set of questions using this chart below as a guide. Clinique chart to determine my skin type! I explained to her my skin concerns. One thing that I definitely know about my skin is that I'm very oily. I hate it whenever I see pictures of me with that shiny forehead or nose. 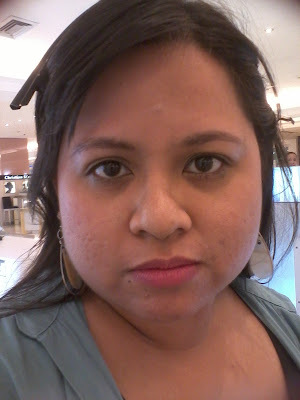 I also told my clinique skin consultant that another concern of mine is the once a month breakout on my T-zone area which also causes blemishes and dark spots once it has healed. Also another noticeable thing about my cheeks are the large pores which is the culprit for my "oiliness" as well. Then as a final test to verify my skin type, Miss Baby very gently and lightly touched my forehead to the bridge of my nose down to my chin and my cheeks. And without much ado she indeed confirmed that (tada!) I'm a Skin Type 4 - Oily. I kind of knew that already. hehehe. She then started to get the Clinique products that I needed to address my skin care concerns. Clinique says that great skin can be created. In just 3 minutes, twice a day, and for two weeks, Clinique's 3-Step Skin Care System creates the clearest, healthiest version of our skin! As a not so young woman anymore (no, I don't think I'd like to share my age to y'all just yet.. hahaha..unless you back read my blog! ), I have to start thinking about taking care of my skin. Through Clinique's easy 3-Step Skin Care System, I don't have to worry about my skin anymore coz taking care of it will be a breeze! So here are the Clinique products that I need to use for clear, firm, and skin. So before doing these steps, off with the makeup! So Miss Baby removed my makeup using Clinique's "Take The Day Off" Makeup Remover for Lids, Lashes, and Lips. I loved how clean I felt after she gently wiped away all my makeup off. Even my waterproof mascara was gently removed! I always had difficulty in removing my mascara. My usual makeup remover doesn't work so I use oil. Still it was tough. But Clinique worked like magic! Miss Baby even taught me a simple trick on how to remove waterproof mascara. removing waterproof mascara is easy peasy! My makeup free face = not happy face. LOL. Sorry about my scary photo. Miss Baby would be fetching something. So now my Clinique's 3-Step Skin Care System is all ready to begin! STEP 1 - CLEANSE "The first step in Clinique's 3-Step Skin Care System. All the benefits of Clinique's dermatologist-developed Facial Soap in a liquid formula. Cleanses without stripping protective lipids. Preps skin for the exfoliating action of Clarifying Lotion. Convenient pump dispenses just the right amount." Miss Baby very gently rubbed the liquid soap on my face taking care to avoid the eye area. The great thing about the liquid facial soap is that you have an option to either rinse off the soap with water or by wiping it off with tissue. My skin consultant used cotton and tissue to clean my face. She told me that we must be always gentle with our skin. Whenever we use tissue or cotton to our face, we must only apply light pressure and wipe it gently. Miss Baby redefined "gentle" in my vocabulary! 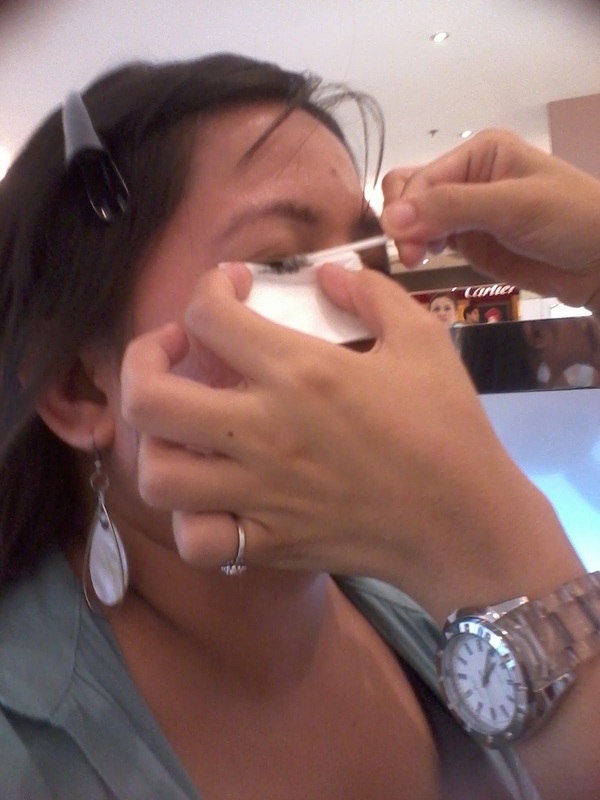 I thought I was already gentle in the way I remove my makeup or clean it but it was nothing compared to what she did! STEP 2 - EXFOLIATE "Exfoliation is a key step for every skin type because it removes dead cells in the surface which are not soluble in soap and water. It also helps to release trapped oil and without exfoliation this would be left behind and one would not be able to achieve the great skin that we know is possible." For my skin type, Clinique's Clarifying Lotion 4 was used. Perfect for my skin type - very oily. "It helps clear away pollution, excess oil, dulling flakes for clear, glowing skin. Helps block a blemish. Purifies pores to look cleaner, smaller. Skin grows stronger, stays clearer, healthier. Dermatologist-reformulated to be comfortable, non-drying." I used to be a strong astringent user when I was in high school. But then I noticed that my face was becoming dry and flaky. It scared me so I stopped using astringents. But after listening to my skin consultant, I am now convinced that Clinique's clarifying lotion will not only address my oily large pores but make it cleaner and healthier by removing the old dead skin cells. In fact I was advised to do this twice a day! I'd never think to do that with my old astringents. But with Clinique, they made it possible! STEP 3 - MOISTURIZE "The moisture "drink" all skins need, developed by Clinique's guiding dermatologists to maintain optimal moisture balance. Works to soften, smooth, improve the condition and texture of your skin. Lotion formula is for drier skins; oil-free Gel is perfect for oilier skins." For my skin type, Clinique's Dramatically Different Moisturizing Gel was used. "The oil-free moisture “drink” developed by Clinique’s dermatologists to maintain optimal moisture balance for skins comfortable in the cheeks but oily in the T-zone or oily all over. Oil-free formula softens, smooths, improves." Photo credit goes to Eunice. Thanks dear! I've always avoided moisturizers. 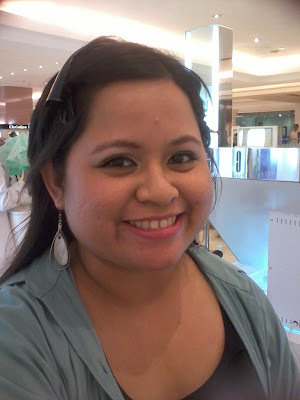 Since I have an oily face, I never bothered with moisturizers because I felt it will only make my skin more oily. I did not want to add oiliness to my face. But Miss Baby explained that moisturizing is an important step that I shouldn't miss. It helps restore the skin's water retaining abilities and makes the skin much more comfortable. That is why Clinique provided a moisturizer that is water based. When she applied it to my face, it felt cool to the touch. My skin absorbed it immediately! I was pretty much impressed. And there you have it! Three easy steps to greater skin. I touched my face after Clinique's 3-Step and it felt smooth and soft to the touch. Wow! Its been a while since I felt like that. Also there was a slight tingle to my face but it subsided after a while. I really felt "sparkling clean!" Just finished using Clinique's 3-Step Skin Care System! Cleaner Face yeah! And of course Miss Baby proceeded to make me more beautiful than ever! 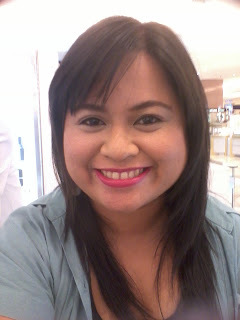 Since I usually use heavy eye makeup, Miss Mira from Clinique advised that I should try a lighter peachy look highlighting my smile. And here is my before and after photos! I'd like to thank Miss Baby, my skin consultant for making me look really fabulous! Also a great huge THANKS to Miss Mira from Clinique. I can't find my photo with you (huhu..) I know I had a picture taken with you but it must be on someone else's camera. Anyway, thank you for giving this opportunity to us bloggers. I really learned a lot! AND of course, many hugs and kisses (hehehe) to the wonderful Wickermoss aka Charles Angel for hosting this party. I'm so happy that I got in the list! I had a blast.. thank you so much! Of course, thanks to CLINIQUE for making all of this possible! Thanks also for letting me to further try out these products at home. I'm having greater skin thanks to you guys! P.S. Wanna have greater skin? Visit CLINIQUE now in Rustan's Makati or at Trinoma. Have a skin consultation with Miss Baby or any of the fabulous Clinique skin consultants. Experience it yourself. I swear it makes all the difference! P.P.S. Busy with work? Then why don't you visit CLINIQUE's website and check out their products. I got the exact product information (the one in italics) from the Clinique website. They also have an online Skin Consultation where you can discover your skin type yourself. So my dear coffeeholics, have you tried out clinique yet? Or do you have your own skin care regiment? Share share! I'd love to hear your comments and suggestions! Share share! SM Accessories Makes A Statement! Surprise Gifts are the Best!